Next week I’m selling some things at a craft/bake sale on base. I’ve been creating a few things for my table including these cute and simple Curled Paper Christmas Trees. 1) Fiberboard or cardboard cone (You could also use a foam florist cone but then you would need to use pins to secure the curls instead of hot glue). My cones are 8″ tall. 2) Approximately 2 – 3 sheets of double sided pattered paper. One 8″ cone takes about two 12″x12″ sheets. 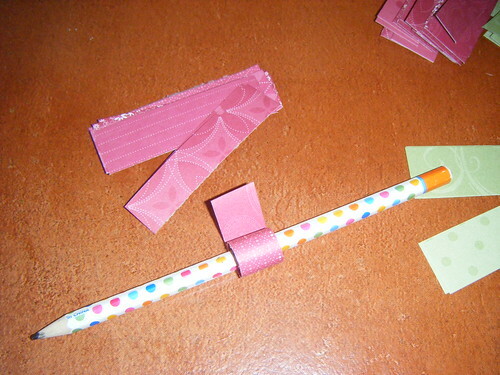 3) A pencil or pen to roll the paper strips. 1) Cut your double sided paper into strips approximately 3/4″ wide and 3″ long. 2) Using your pencil curl the paper strips about 3/4 of the way to the end. You can make your curls loose or tight, whichever you prefer. You can also loosen up the curls once your tree is completed. 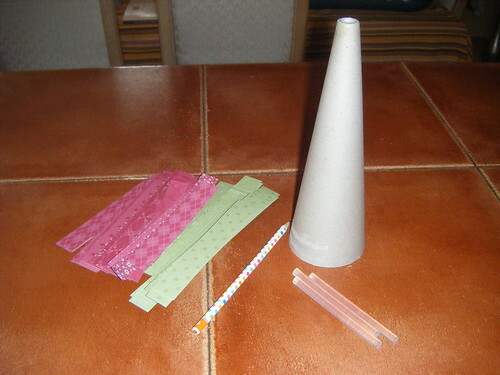 3) Gather your paper curls together with your cone and your glue gun and glue sticks. 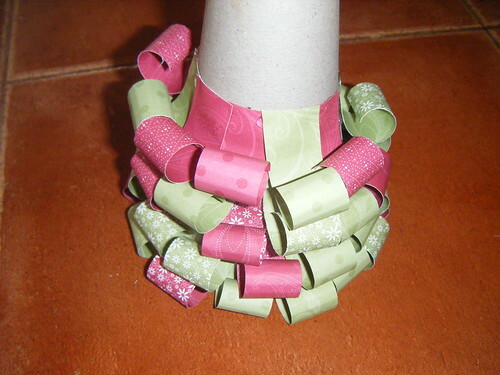 4) Start gluing your paper curls to the bottom of the cone in a ring. 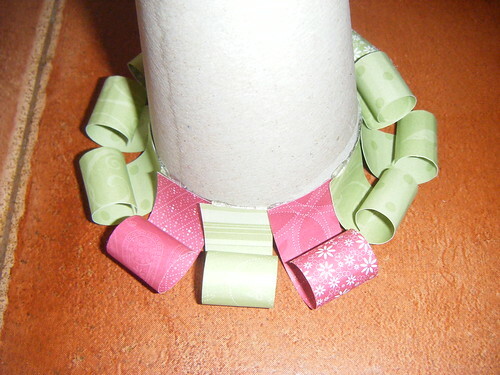 5) Continue to glue on paper curls in layers or rings moving up the cone. My rings are about 1/2″ to 3/4″ apart, meaning when I finish one ring I leave a gap of about 3/4″ inch of cone in between so my curls are not tightly glued together. You can leave more or less room, as you like. Try to alternate your rings so that your curls overlap like scales. 6) Once you get to the top of the cone, you can add an embellishment to the top. I used snowflake shaped brads punched through a small circled of paper but you could use buttons, chipboard shapes, rhinestones, etc. You could make these for any occasion or season. All sorts of papers or themes can be used and different papers will create different looks. 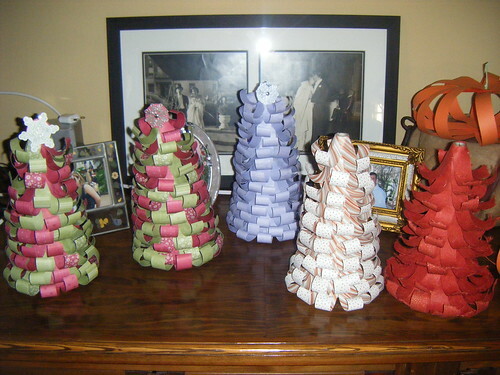 From left to right: the first 2 trees are made with 1 sheet of red patterned paper and 1 sheet of green each, the 3rd (purple) tree is made with 2 sheets of purple pattered paper, the 4th tree is made with 2 sheets of patterned paper with stripes on one side and polka dots on the other and the red tree is made with 2 sheets of red natural textured paper with tiny gold dots (the curls on this tree didn’t stay as stiff and look really feathery). The last two trees do not have embellishments on the top yet, I am still deciding what would look the best on these trees. 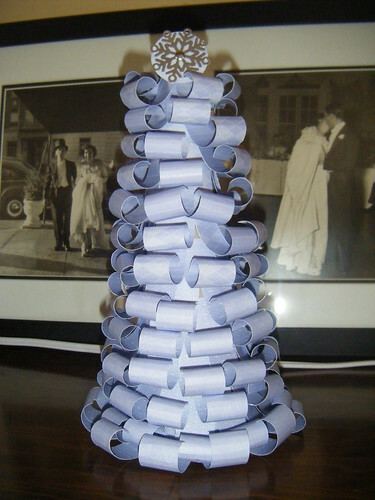 If you make a Curled Paper Christmas Tree please send me a link, I would love to see some other variations. 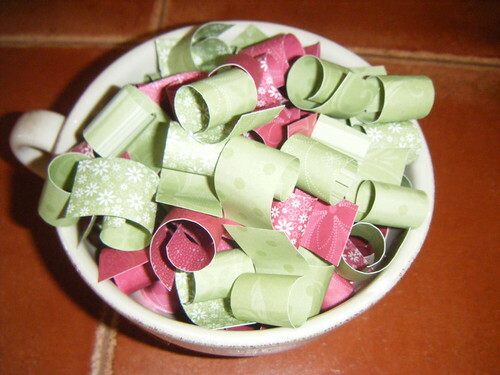 This is a wonderful craft idea and perfect for using the scraps from making paper snowflakes. Very cool! Great tutorial and it looks so do-able! i really like wat you did it’ll be perfect for my christmas party tnx…. Very cute. I am always on the lookout for things my 4th and 5th graders can make for their parents at the holidays. These look great. TOO cute! Thank you so much for the idea and directions!! Have a fantastic week!! Tutorial was outstanding ! 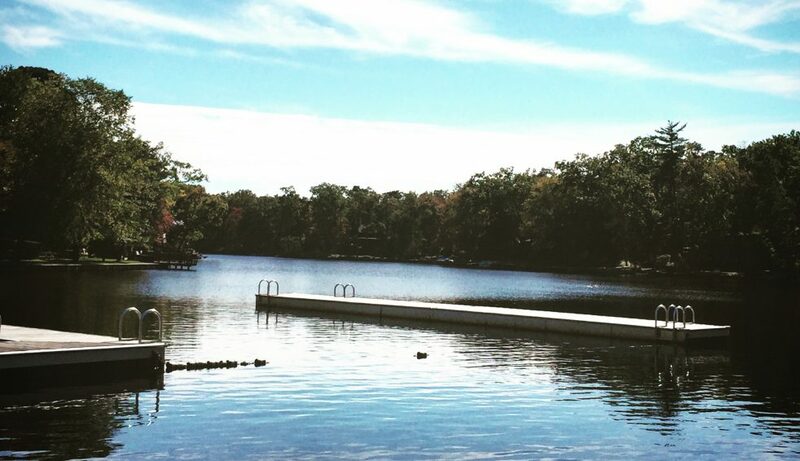 Thank you for sharing this with all of us! Childern would love making these. Thanks for the instructions, I did a google for curly christmas tree and found you. Looks like a whole lot of paper curling.